Roughly 80% of women develop uterine fibroids by age 50, although not all women experience symptoms. Fibroids are benign masses that can sometimes cause severe pain and discomfort. 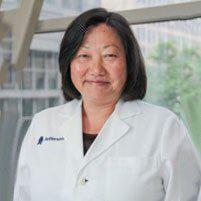 If you’re in the Philadelphia area, visit Christine Wu, MD: the area’s leading fibroid specialist. Dr. Wu uses advanced diagnostic and treatment options for fibroids, so you don’t have to experience discomfort any longer. Before living another day with lower abdominal pain, schedule a fibroid evaluation by calling the office, or by booking online. Uterine fibroids — often simply called “fibroids” — are abnormal growths that develop in the walls of your uterus. While these tumors can certainly become large, they’re almost always benign, or noncancerous. It isn’t clear why some women have fibroids while others don’t, although it’s believed that family history, hormonal fluctuations, and pregnancy history can all play roles. What are the different kinds of fibroids? The most common type of fibroid is an intramural fibroid. These develop in the wall of your uterus; if they grow too large, they can stretch your uterus, causing pain and discomfort. Subserosal fibroids — less common — form on the outside of your uterus, and under imaging, can make your uterus appear lopsided. When subserosal fibroids develop a stem that holds up the tumor, they become known as pedunculated fibroids. The final type of fibroid is a submucosal fibroid, which develops in the middle layer of your uterus. While not impossible, uterine fibroids can make it difficult for you to become pregnant. If you’ve been struggling to get pregnant, Dr. Wu may suggest an ultrasound to see if you have these abnormal growths. Fibroids don’t require treatment unless you’re experiencing pain, heavy bleeding, or other symptoms. For minor discomfort and heavy bleeding, Dr. Wu could start conservative treatments, such as medications that stabilize your hormone levels. Surgery is generally the last resort for treating fibroids. Dr. Wu removes fibroids using small incisions and state-of-the-art tools, so you don’t have to worry about an extensive recovery or impacted fertility. If you have multiple growths, however, you may need an endometrial ablation, which destroys the uterine lining, or a hysterectomy (the removal of your uterus). Either of these procedures would prevent you from conceiving. If you have a history of fibroids or have undiagnosed lower abdominal pain, book an appointment with Dr. Wu. Schedule either online or over the phone.